South Africa held off a late charge to beat Ireland 19-13 and win their series in the third Test at Nelson Mandela Bay Stadium in Port Elizabeth. Although Ireland were at the end of their season they finished the match strongly and kept South Africa under real pressure in the final minutes. Ireland strung together almost 20 phases in the final minutes of the match and created the overlap but Faf de Klerk put in a big tackle which won South Africa a penalty which ended the match and handed the Springboks the match victory and the series. Ireland won the first Test but South won the second two. Given their superb performances to date, Ireland posed a serious threat for a first-ever series win on South African soil but the Boks seemed far better prepared to ward off the danger although this time, they relied on the boot of their place-kickers Elton Jantjies and Ruan Combrinck to make the difference after each side managed a try each. Ireland sounded an early warning when they used a decided possession advantage to good effect in the opening minutes and the Boks were forced to settle for a largely defensive role in trying to contain the crossfield sweeps out to the wider channels. After 10 minutes play, the lone area where the Boks held the upper hand was at scrum time but a lack of initiative meant they were not able to capitalise on this advantage. Instead, it was left to Bok flyhalf Jantjies to open their scoring account when he goaled one of two early penalty attempts (3-0). 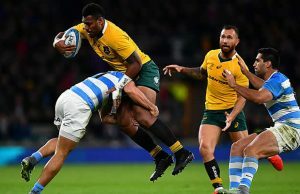 The match had its first flashpoint in the 17th minute when Bok fullback Willie le Roux was yellow-carded by New Zealand referee Glen Jackson after he waged a challenge on his Irish opposite number Tiernan O’Halloran for the ball after a high kick ahead by Bok scrumhalf Faf de Klerk. A review of the incident showed that O’Halloran was clearly well-placed to take the catch and Le Roux knocked him off balance in mid-air. Ireland wasted no time taking advantage of having an extra man on the field and after a forward-driven surge upfield, centre Luke Marshall burst through Jantjies’ defence channel to grab the opening try in the match. 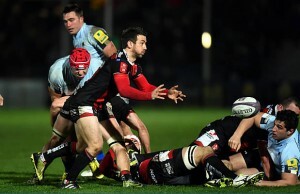 Flyhalf Paddy Jackson was on target with the conversion 7-3. Le Roux’s return did not prevent the Irish from stretching the lead when Jackson goaled a 40m penalty to stretch the lead to seven points (10-3). The Boks’ vastly superior scrummaging performance seemed to induce a renewed sense of purpose in their ranks and after Jantjies reduced the deficit with a penalty in the 31st minute, the momentum seemed to be shifting away from the Irish (10-6). Just ahead of the halftime break, the Boks regained the lead after excellent work at the breakdown by their flank Siya Kolisi. Once the ball was recycled out to the backline, Jantjies struck an inch-perfect cross-kick towards the corner flag and leftwing JP Pietersen was up in a flash to gather and score. Jantjies converted splendidly from the touchline for a 13-10 halftime lead. The Boks continued where they left off when play restarted although they seldom threatened a breakthrough as the Irish weighed in with dogged defence which stopped several raids into their territory in very effective fashion. Around the 50th minute mark, Ireland managed to reverse the flow of play with a succession of attacks from recycled ball. One such move into the Bok 22m area created an overlap but with the tryline at their mercy, De Klerk made a dramatic try-saving interception by launching himself into the air. Props Steven Kitshoff and Julian Redelinghuys were sent on to provide the Boks with fresh legs and three minutes later the Boks were able to open a six-point lead when winger Ruan Combrinck goaled a penalty on the hour mark (16-10). Interestingly, for the first time in the three-Test match series, the Boks looked like they could win the match after 60 minutes play. 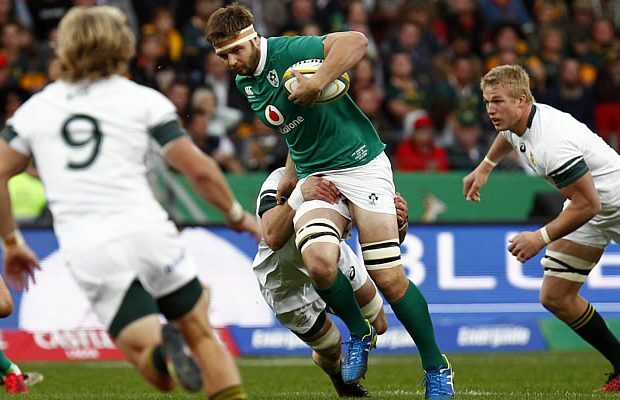 The Irish looked to stage a fightback but they suffered a setback when their SA-born flank CJ Stander was penalised for a breakdown infringement. Two minutes later, the Irish again incurred the wrath of Jackson and this time the penalty was within kicking range and Jantjies goaled for a 19-10 lead but the three-point advance was cancelled out soon afterwards by a Jackson penalty in the 70th minute (19-13). It was just the injection the Irish needed as they staged a valiant but unsuccessful fightback to save the match. Ireland mounted several multi-phase attacks deep into the Bok territory but they were met foiled by steely defence to deny them at the death – much to the obvious relief of South Africa and the team’s management.